Ground Water level had increased. The rainwater conserved cand solve problem of drinking water. Therefore, we can save time of people, especially women who have to stand in long queue to get water from the tankers. The rainwater conserved would help to recharge groundwater, which in turn would be available for irrigation purpose. With irrigation, the quantity and quality of agriculture produce could ne improved, which would give economic return. With better economic return, surplus income could be invested in imporving quality of life – on education, health and public sectors. Water in greater quantity would contribute to higher growth and sustance of vegetation and vegetation would be able to correct the rain cycle. It would attract clouds to region and the region would be benifited with higher rainfall. The Government would be able to save resources spend for water and tankers. These resources could be employed for other development activities like drainage, road construction and so on. 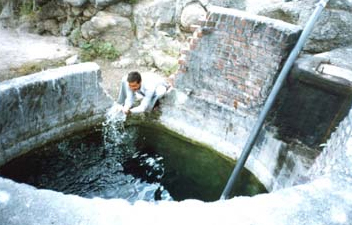 More water would encourage social gatherings and bring different castes and communities closer to each other. With groundwater recharging, pressure of sweet water would increase in comparision to seawater and salinity ingress would be controlled through this process. With greater water availability, fodder would be availabel which would encourage and support animal husbandry and in turn milk and milk production. These activities would promote dairy and pastoral activities. Water will provide life to all types of biological lives – human, insects, animals and thus the biological cycle would be balanced.